Welcome to Monday! The day that always seems to take me by surprise with it’s seemingly extra early alarm clock. The day that has you wishing that Sunday would repeat itself. Or maybe you just wish you had one more day to recover from the weekend. Whatever it is, we’re here, it’s time to face the day and make it just the best you can. That’s what Motivational Monday is about. It’s short. It’s to the point. And it’s designed to make Mondays just a little bit better for you without getting in the way of everything else you’ve got going on. So let’s get to it! I want you to think about all the people in your life. Of all those people, I want you to think about the parts those people play in your life. You have family. You have friends. You have acquaintances. You may have co-workers. There are a number of different people you allow into your life. Some may be positive. Some may be negative. The role they play and the energy they bring into your life is something I urge you to think about. As you are striving to live a healthy life, it is absolutely imperative that you are keeping the right types of people in your life. Your recovery, health, and well-being depends on it. Having negative energy in your life will bring you down. People with negativity have a way of dragging you into it. As you talk about your struggles, instead of trying to pull you out of it, they will talk about their own struggles, and you will each pull each other deeper down into a negative mindset. The awesome thing though is that there is a flip side to that. The people you surround yourself with have a direct correlation with the way you live your life. The more positive people you have in your life the better, because they will bring you higher. They will encourage you to live to your highest potential. They will motivate you to have a positive outlook on life. They will be rooting for you all the way. They will help you to see how far you can grow. They will give you hope and light. So the next time you talk to a friend, family member, co-worker, or acquaintance, I want you to be absolutely honest with yourself and ask: Is this person lifting me higher? Is this a positive influence in my life? Is this person supporting me in my choice to be healthy and happy? Don’t make excuses for the negative people in your life. It is necessary that you look out for yourself. Be picky about the people in your lives. 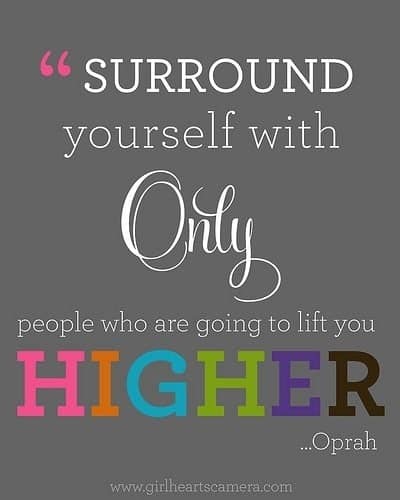 Choose those who actively lift you higher.